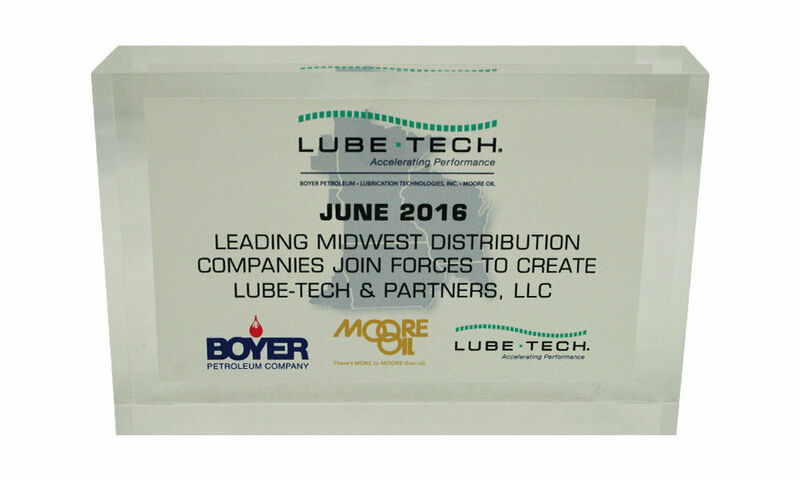 Custom designs and shapes can play off a variety of shapes, including those based on your logo, product, industry,service area or award theme. 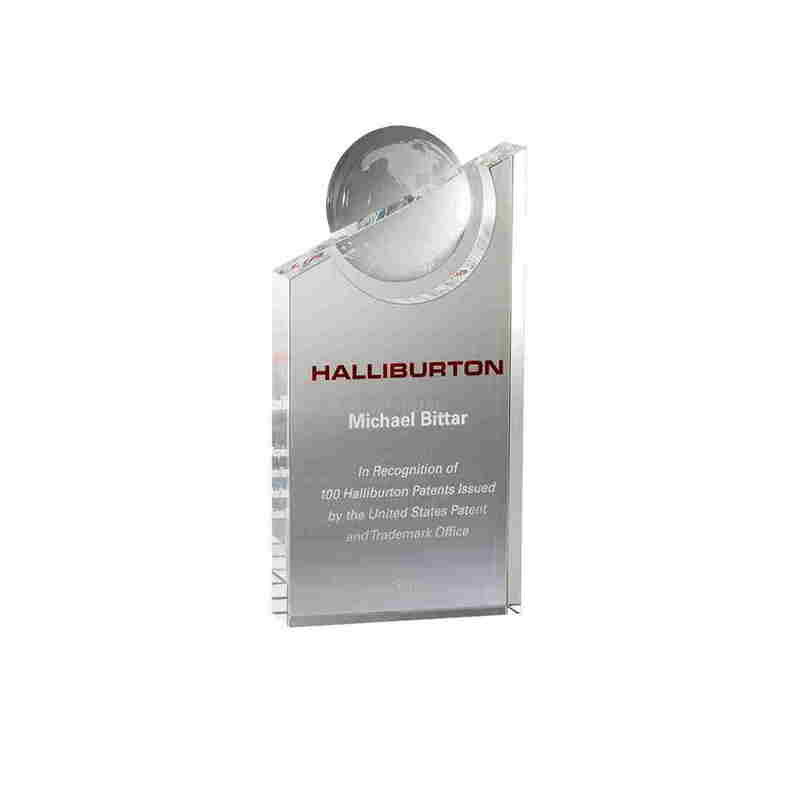 Globe-themed custom crystal recognizing an employee of Halliburton being awarded 100 U.S. patents. 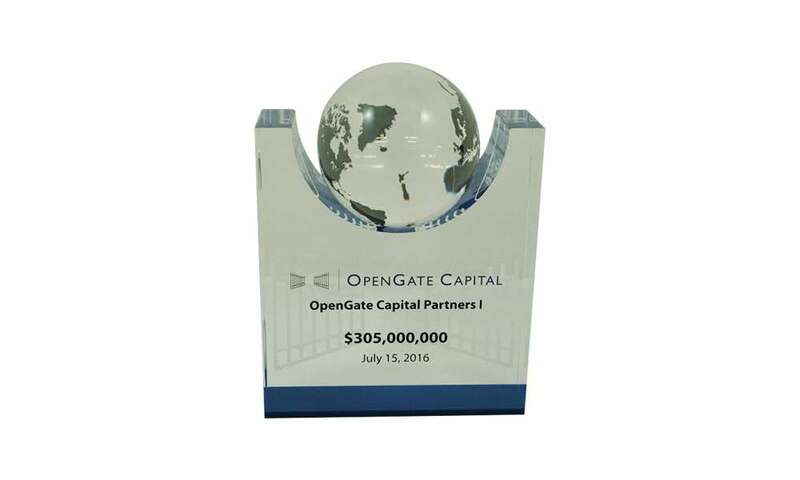 Custom Lucite award celebrating the closing of OpenGate Capital Partners 1. 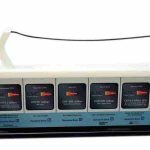 The fund was launched by the Los Angles-based private equity firm OpenGate Capital. 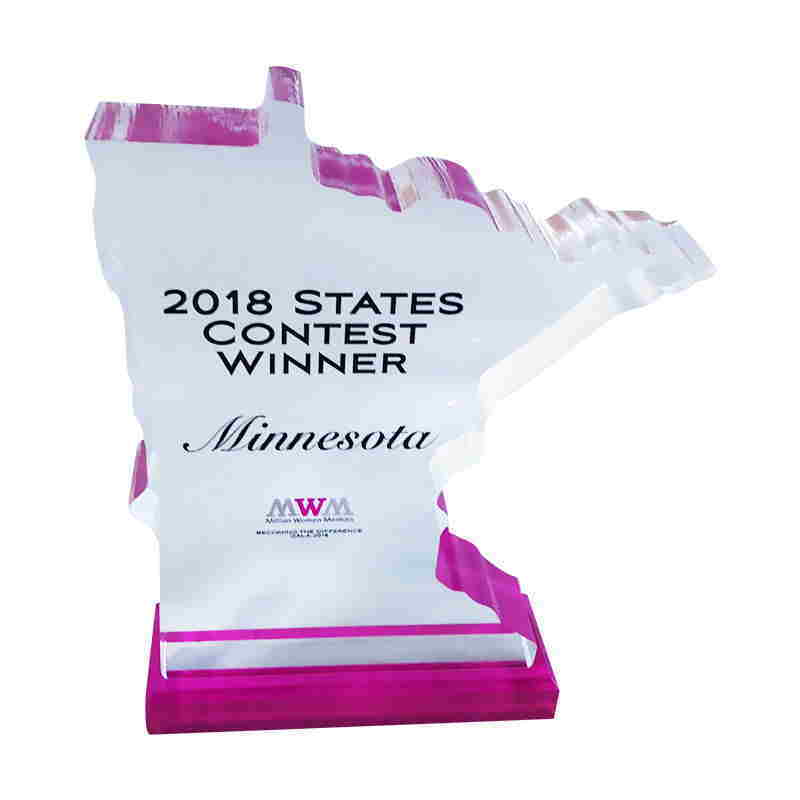 Custom mentorship award created for the Minnesota organization of Million Women Mentors. The organization fosters opportunities for women and girls in the STEM fields (science, technology, engineering, and math). 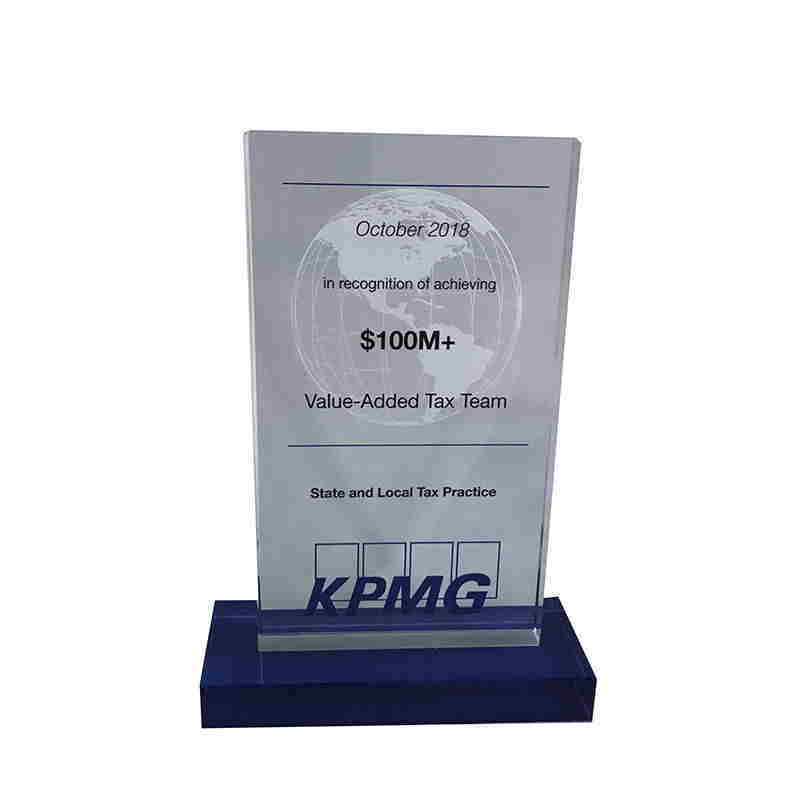 Custom crystal recognizing the achievement of a milestone by KPMG's tax group. 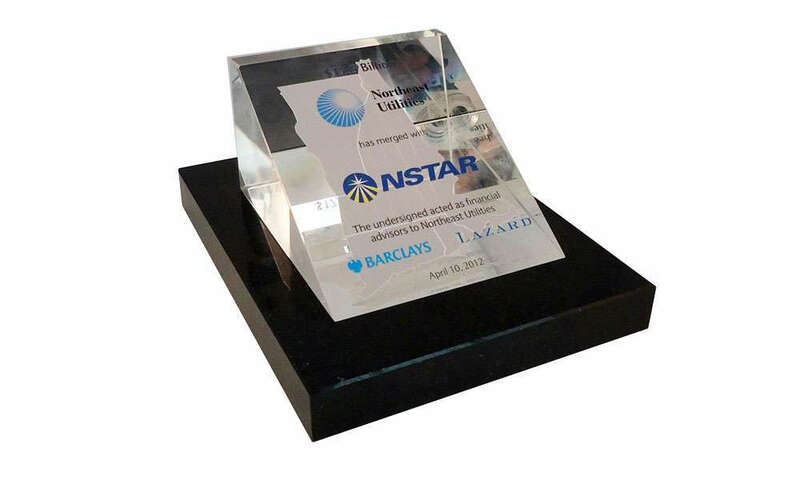 Crystal tombstone, featuring laser-etched world map, commemorating a strategic investment by Great Point Partners in MasSTherCell, a Belgian developer of gene and cell therapies. 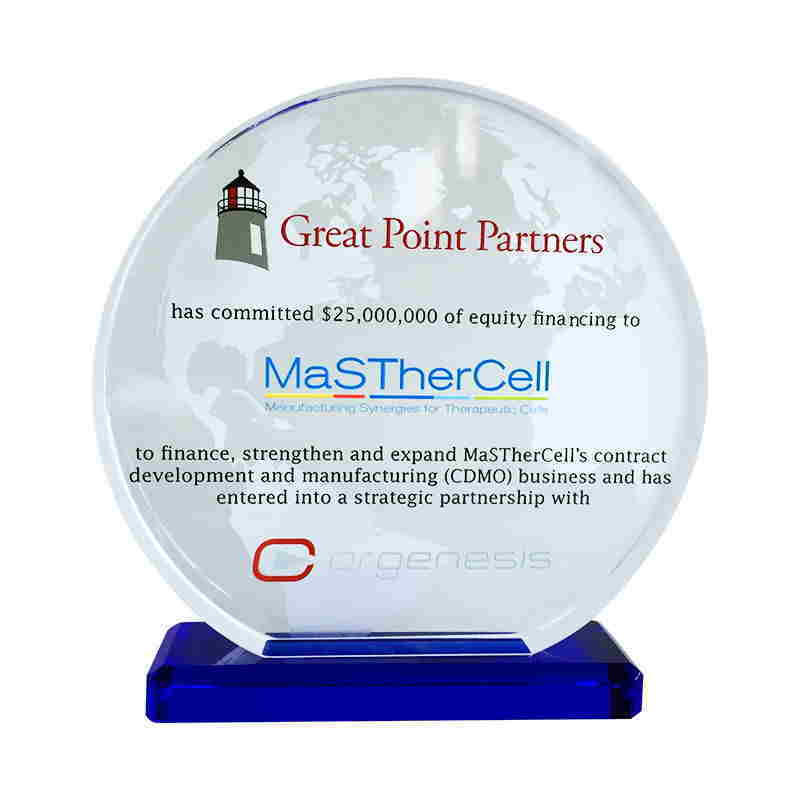 Great Point Partners is headquartered in Greenwich, Connecticut. 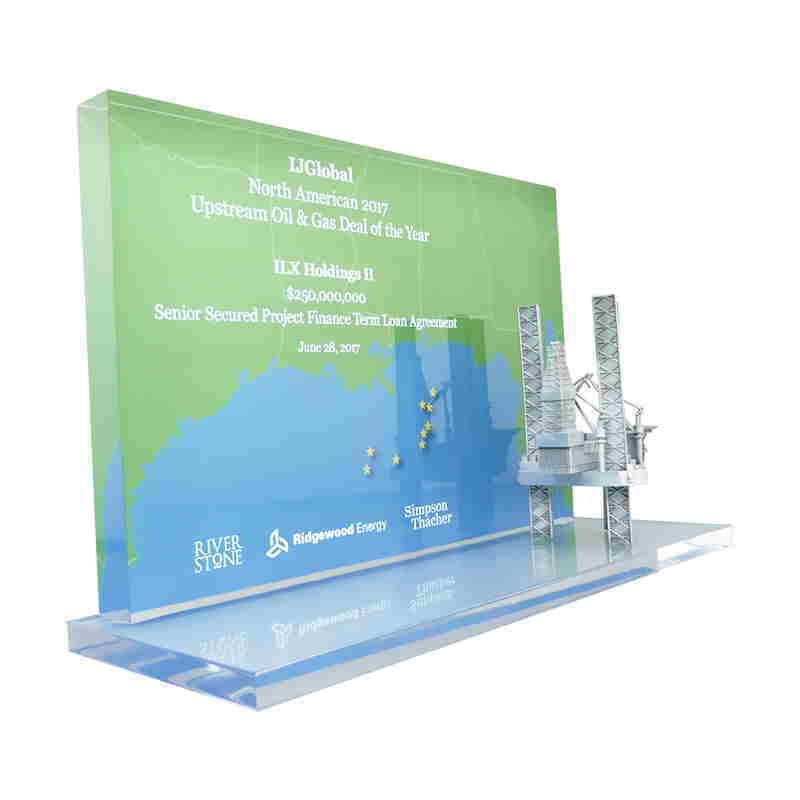 Custom crystal recognizing a loan agreement as a winner of the 2017 IJGobal Upstream Oil & Gas Deal of The Year. 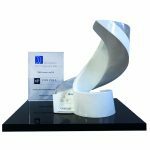 The annual awards recognize achievement in the infrastructure sector. 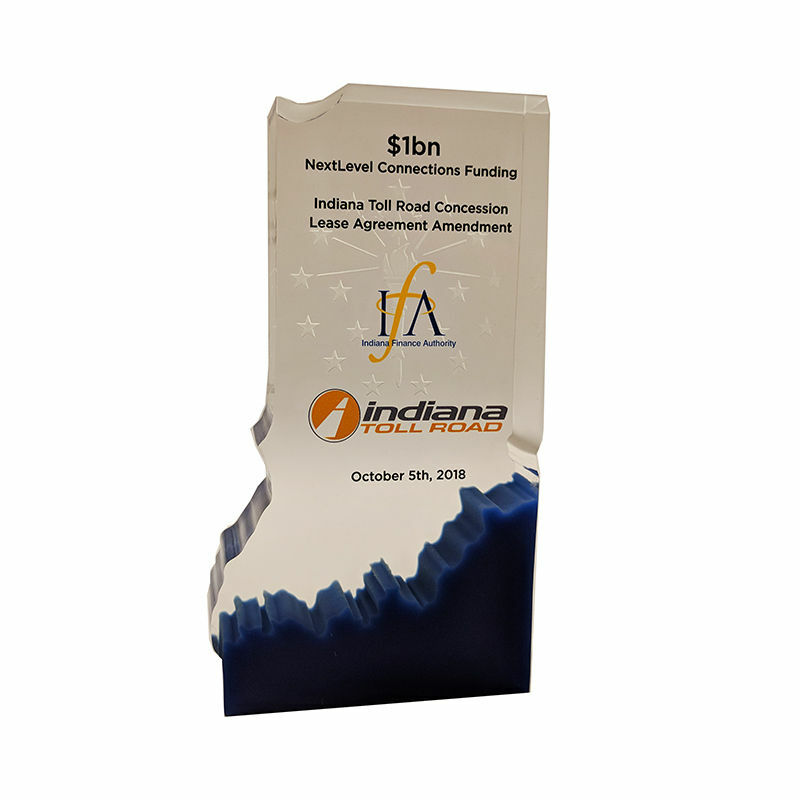 Participants in the deal included Riverstone, Ridgewood Energy, and the law firm of Simpson Thacher. 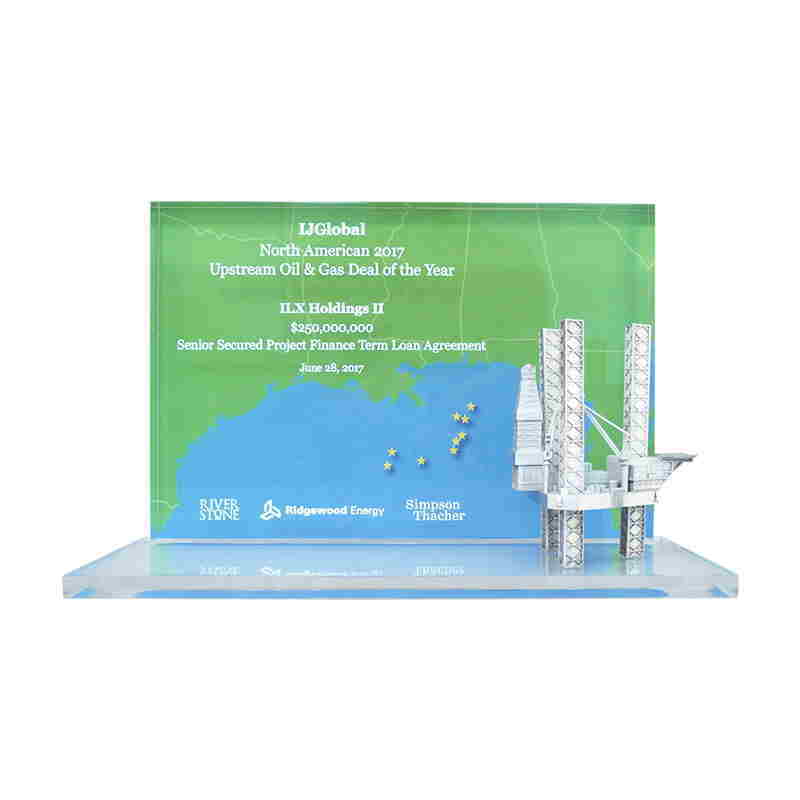 Crystal deal toy, featuring a pewter offshore oil rig, commemorating loan agreement for ILX Holdings.The oil and gas exploration and production partnership focuses on the deepwater of the Gulf of Mexico. 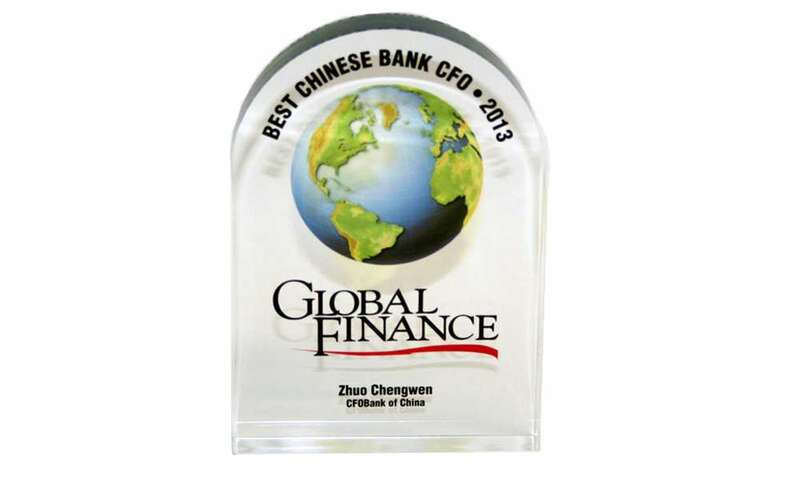 One of the custom acrylic awards given annually by "Global Finance" magazine. 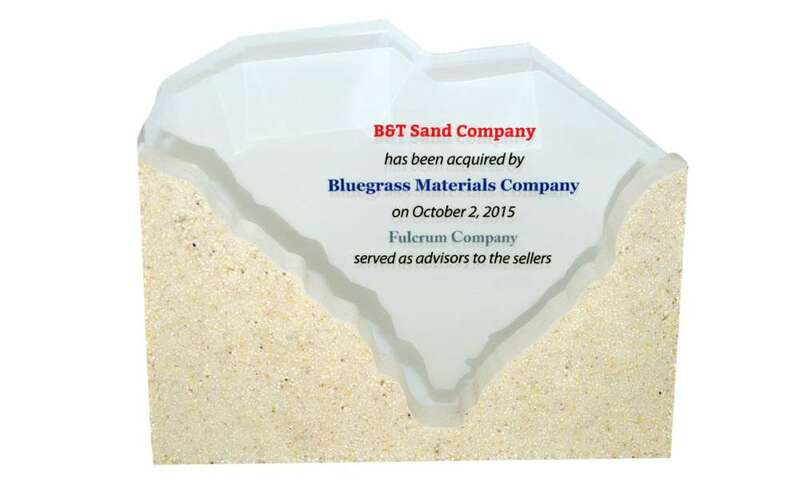 Texas-shaped custom Lucite marking the acquisition of a landfill gas development project in Angleton, Texas. 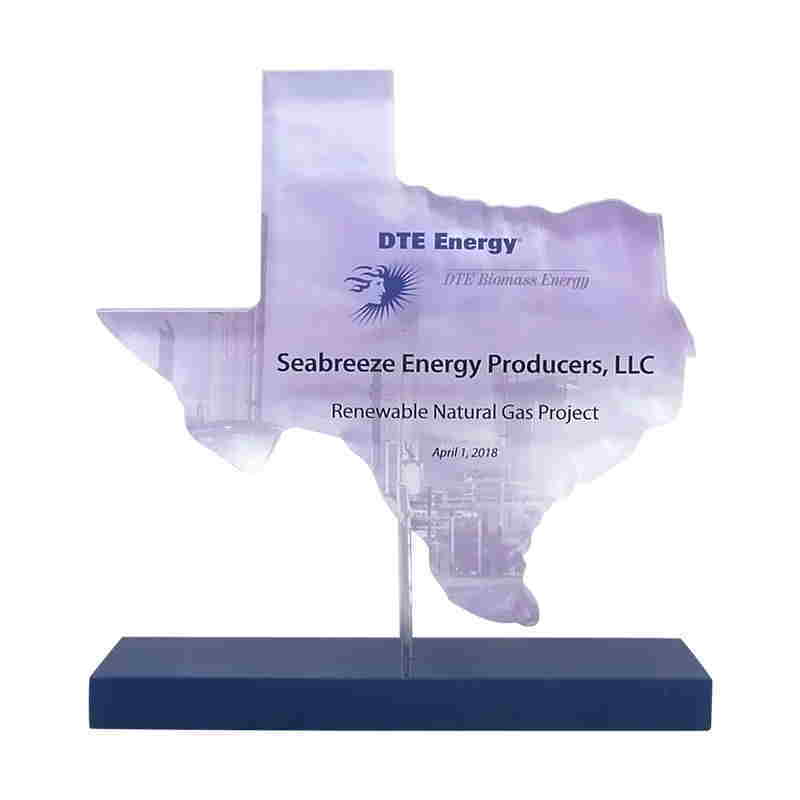 Custom Lucite commemorating the acquisition of a landfill gas-to-energy project in Texas. The acquirer was Detroit-based DTE Energy. 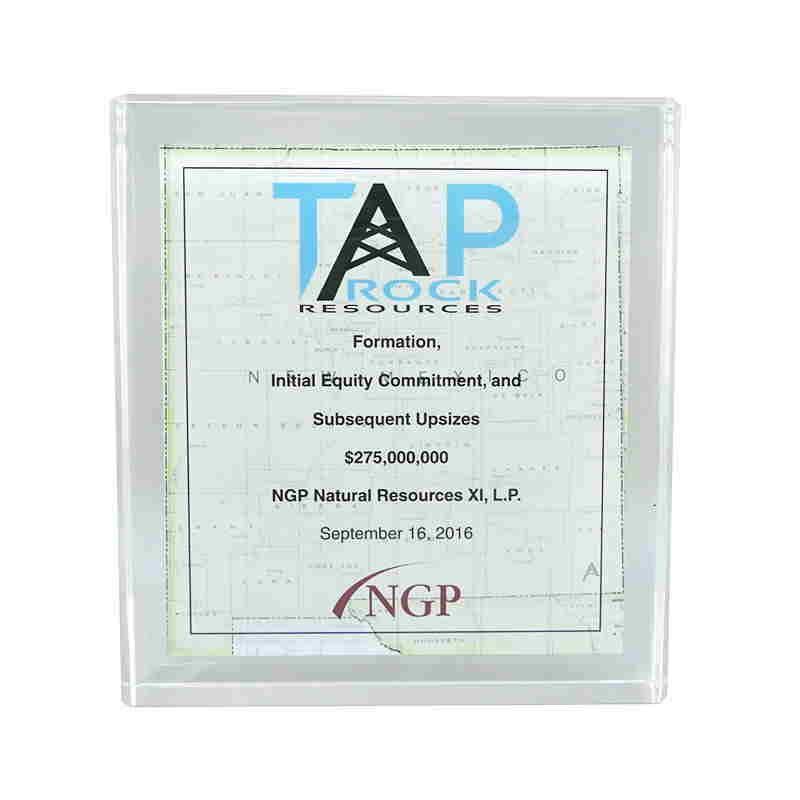 Acrylic commemorative marking the launch of Tap Rock Resources, based in Golden, Colorado. The firm focuses on natural gas exploration and production in the Permian Basin region. 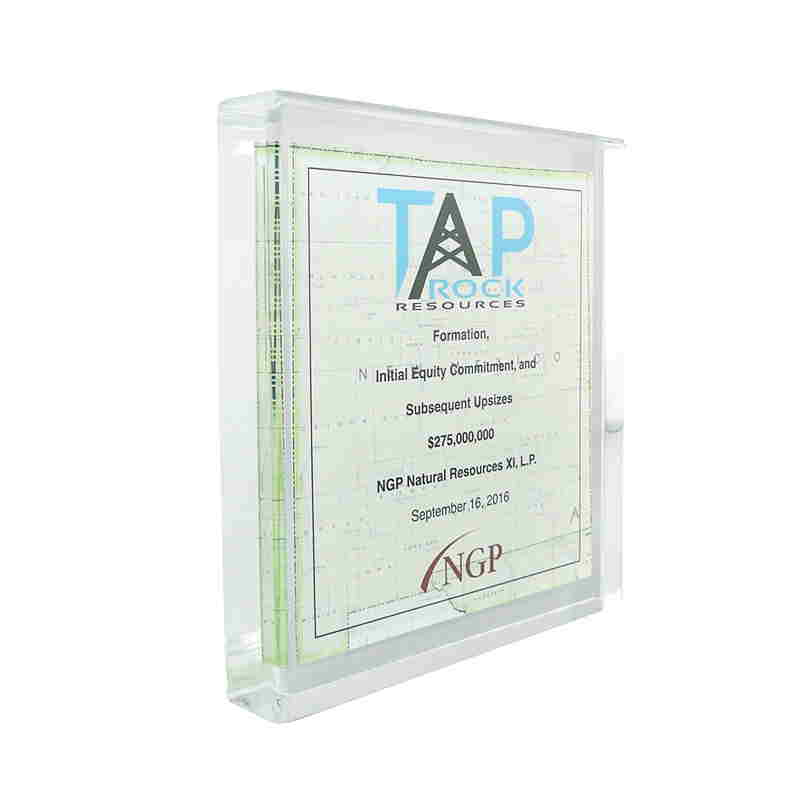 Lucite commemorative celebrating the launch of Tap Rock Resources. The Golden, Colorado-based firm focuses on natural gas exploration and production in the Permian Basin region. 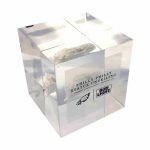 Globe-themed crystal award recognizing notes issued by Western Asset Mortgage Capital. MMC is a real estate investment trust (REIT). 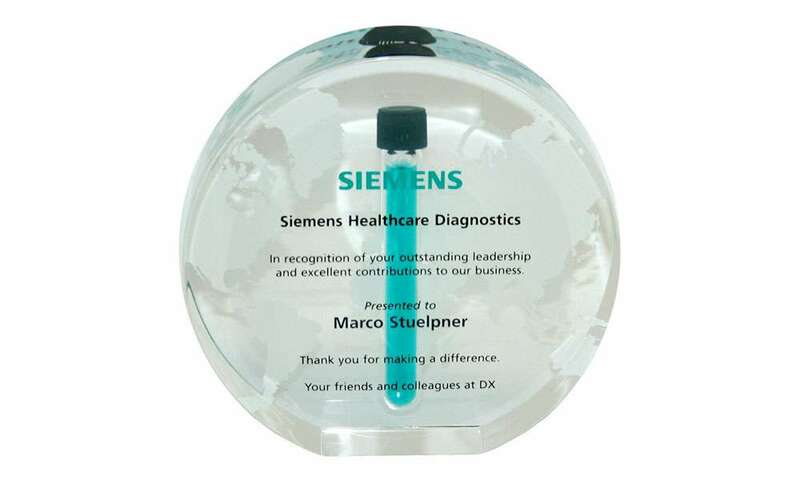 Custom acrylic award with embedded test tube honoring leadership at Siemens Healthcare Diagnostics. 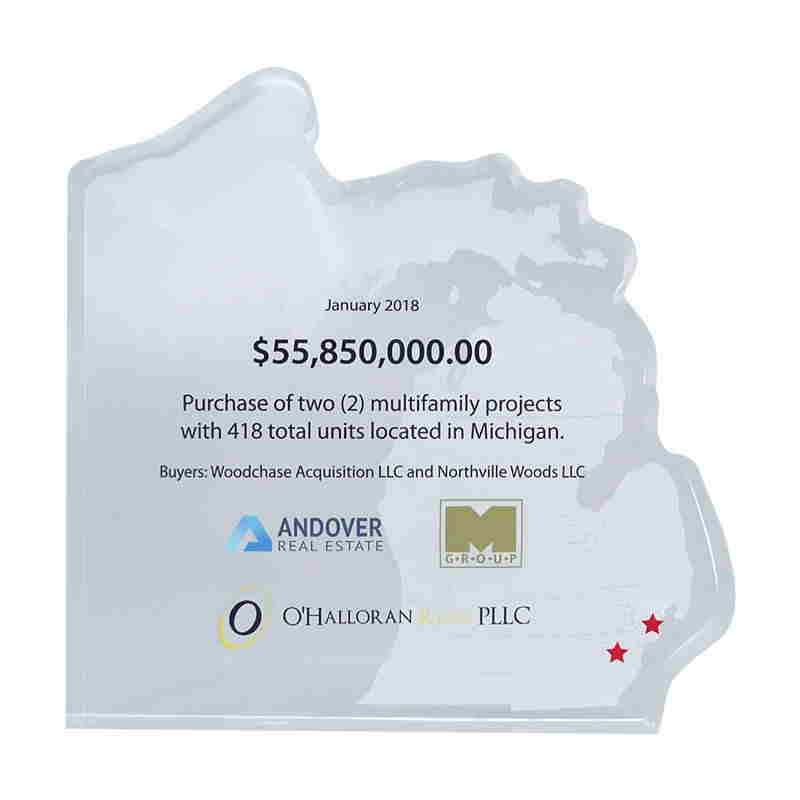 Custom acrylic commemorating the purchase of two multifamily residential complexes in Michigan. 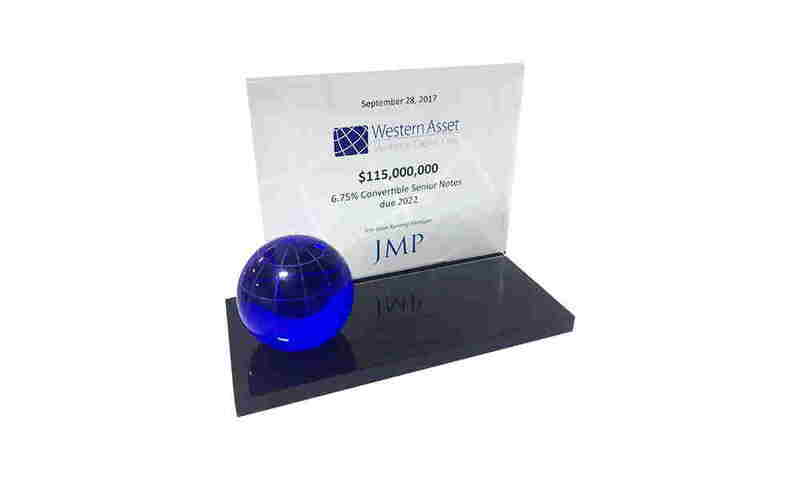 Globe-themed custom Lucite celebrating the closing of an international emerging markets fund. 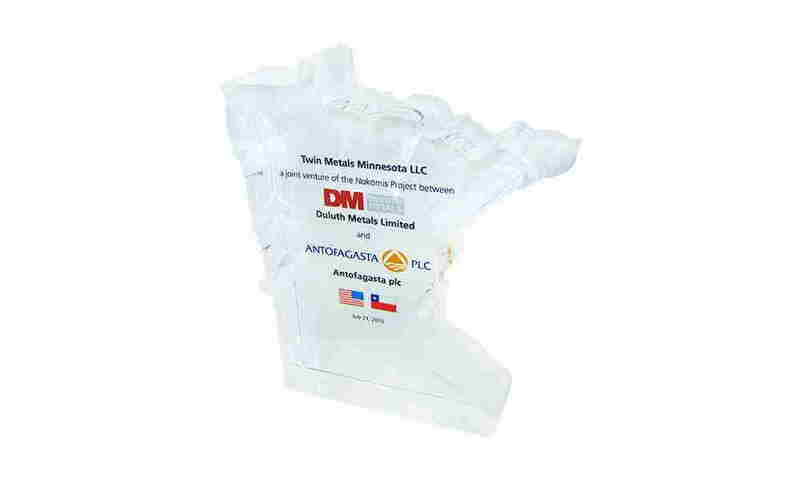 Minnesota-themed custom Lucite commemorating a joint venture between Duluth metals and Antofagasta, a mining company based in Chile. The joint venture centered on a copper-nickel mine in Northeast Minnesota. 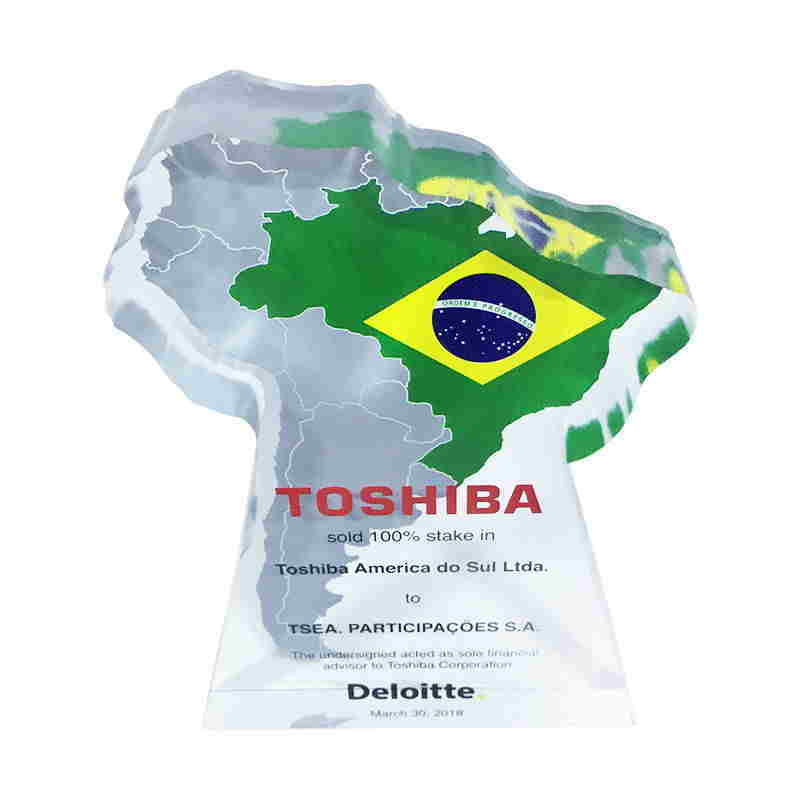 Crystal deal toy with map of Brazil commemorating the sale of Toshiba's Brazil-based subsidiary Toshiba do Sul Ltda. 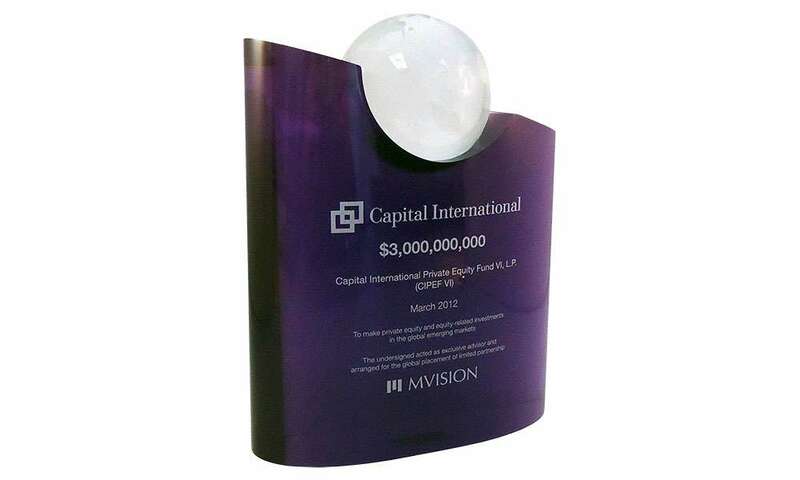 Custom acrylic award celebrating the closing of Longitude Capital's Longitude Venture Partners III fund. 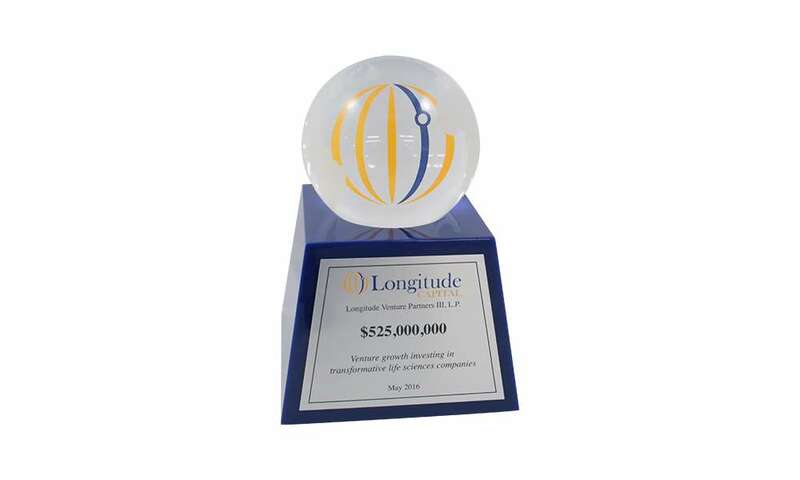 Longitude is an investment firm focused on biotechnology and medical technology, with offices in Greenwich, Connecticut and Menlo Park, California. 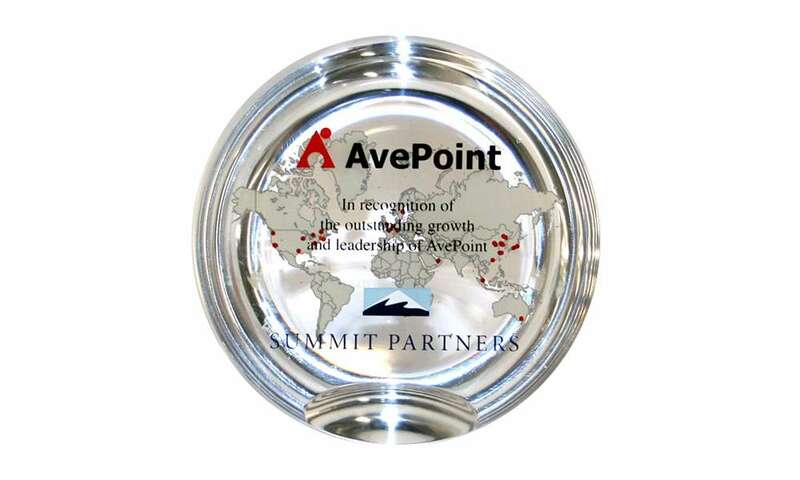 Custom acrylic client appreciation gift presented by private equity firm Summit Partners saluting the management of New Jersey-based software firm Avepoint.